Serves 4. Preparation time 5 minutes. Cooking time 1 hour. • Mix the soup powder with the cream. Chop the courgettes into chunks. 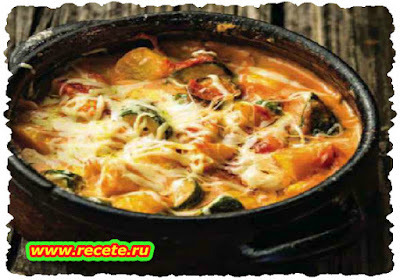 Layer the courgettes, pattypans and potato in a pot, pouring cream between each layer. • Put the pot on the coals with a few coals on the lid and bake for 1 hour. Sprinkle the cheese on top just before serving.